Enjoy the true richness of our holiday with Green Tree Holidays, your exclusive gateway to the perfect trip which will leave a lasting impression. The Wallawwa, an old colonial manor house, has been lovingly restored to provide 14 beautifully furnished bedrooms and suites – ten Garden Suites, two Wallawwa Bedrooms and two Family Suites. Deep in the cultural triangle of Sri Lanka an ancient marvel stands proud – the world renowned rock fortress of Sigiriya. A hotel that pays homage to its beauty and uniqueness, also sits hidden quietly in the plains of its shadow. Here, turn back 2000 years and imagine life as it was. Welcome to the matchless wonder of Jetwing Vil Uyana – the privilege is yours. And when you have enjoyed all they have for you. Set in 7 acres of beautifully tended gardens nestled in the heart of the up country tea estates of Ceylon. The Lavender Houses' five Bedrooms are furnished with traditional pieces giving each room its individual character offering every comfort and amenity. Each of the five suites is furnished with rich textiles and antiques with personalized courtyards. The Lavender House offers informal luxury, A country house which is operated more like a private home. Garden flowers, log fires and home grown vegetables all contribute to the comfortable feeling of this well maintained home. Here in solitude, at an elevation of 4000 feet above sea level, lies Ceylon Tea Trails, four colonial era tea planters' bungalows , infused with a new and decidedly gourmet vibe. Each villa, built between 1890 and 1939, offers a taste of gracious living thanks to butler service & authentic period furnishings, accompanied by gourmet meals. Guests are absorbed into life on a working tea estate, whilst reveling in five-star luxury. Tea Trails will teach you everything you need to know about the perfect brew. The unique Tea Experience tour with the tea planter in residence will show you the wonders of Camellia Sinensis (the botanical name for tea). Tailor made mobile safaris that combine professional naturalists, luxurious facilities and exclusive surroundings deep inside the National Parks. Their safari experience is a unique adventure alternative to the standard hotel based holiday, you will sleep in customized tents, have hot and cold showers, with gourmet dining under the stars in the knowledge that yours will be the only dinner party for a hundred square miles. We invite you to explore and discover Sri Lanka's abundant wildlife, including leopards, elephants and bears as well as some of the world's best birdwatching. One of Sri Lanka's finest and most distinguished luxury boutique hotels Aditya Resort, provides personalized services in an elegantly lavish environment in a private beachside location in Galle. The suites offered at the resort are unique in its interiors designs and are adorend with exotic artwork and antiques with modern amenities and private plunge pools. Welcome to a world of pampering and luxury. A Retro-Chic Hotel with 12 designer suites housed within a grand 200 year old mansion, Casa Colombo's style is a tonic for the senses and a breath of fresh air. Placed in a very heart of the city with WiFi, Hifi and al lthe accoutrements of a personal office, our suites are just perfect for those on the go. For the less inclined, it's a quiet escape, secluded from the intrusions of the city. The pink pool makes headlines, whilest Domos make each guest feel as though they were the only ones staying at Casa Colombo. 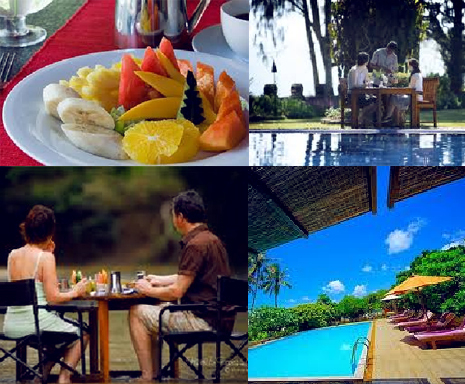 - Entrance fees to National Park, Sigiriya Rock Fortress.